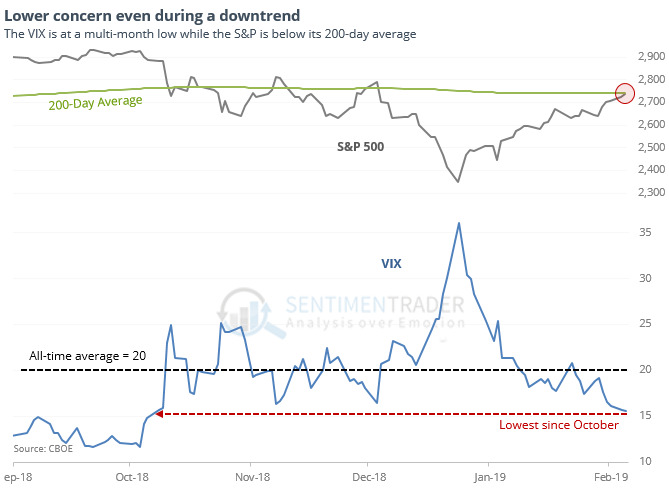 Even while the S&P 500 remains below its 200-day average, the VIX has slipped to a multi-month low and is well below its long-term average of 20. This has consistently led to trouble over the short- to medium-term as the ebbing of concern showed that investors were too quick to price in lower volatility. Most notably, over the next six months only two days managed to sport a positive return, and those were small. The thrust in stocks over the past few weeks has taken almost all S&P 500 stocks above their 10- and 50-day averages, while fewer than 60% of them have managed to climb above their 200-day averages. Over the next month, it was quite negative, with only 3 gains versus 6 losses, and risk twice as large as reward. But after that, the thrusting nature of the signals led to generally positive returns. Momentum does not die easily. Optimism on gold has been ticking higher and is now above 60. During bear markets, optimism often peaks before getting much beyond 60 (during bull markets, it usually stays above 40). During gold’s bad 7-year stretch, when the Optimism Index was this high, its average return over the next month was -1.4% with only 28% of the days showing a positive return according to the Backtest Engine. The McClellan Oscillator has ended its streak above 50 after 22 days. That was the longest streak in history. The only ones nearing it ended after 19 days on 1962-11-30 and 1966-11-11. San Francisco Fed President Mary Daly is scheduled to participate in a moderated Q&A in San Francisco at 1:15 p.m.
More dovishness, if that is at all possible, will spark a rally, even if temporarily. Most stocks are up, and yet some worry. A blistering run of gains has powered nearly all of the stocks in major U.S. indexes higher this year, making some investors uneasy that the nearly decadeold bull market will face another bout of volatility. ALGOs rule..... they control the markets, NOT EMH! That’s the efficient market hypothesis (EMH) in a nutshell. I won’t go on about it much more, because unless you are a particularly closeted academic, you probably don’t buy into the fundamentalist take on the EMH in any case. But the EMH does still lie at the heart of a lot of market analysis. It’s one of those things that people know is not true, but they act as though it is because it makes it easier to create forecasts and because there’s nothing obvious to replace it with. And partly because of that belief, we expect things to happen in markets for reasons. Take the dip in the market yesterday. There’s a good chance that this might just have happened because people suddenly realised that the market has bounced a lot and maybe it’s not as cheap or exciting to buy as it was just a month ago. But that’s not a good reason. It’s a bit too “just because”, for our liking – it’s not a good story. A better story is to argue that it’s because Donald Trump said something a bit dismissive about China. Or that a no-deal Brexit became a little more likely. Yet the first example is probably the closest to the truth. Edited by robo, 08 February 2019 - 09:05 AM. Longtime readers know the VIX triggers a stock market sell signal when it closes below its lower Bollinger Band and then comes back to close inside the bands. Those signals are powerful. But, they’re also rare. And holding out for the VIX to actually close below its lower Bollinger Band before getting defensive would have meant suffering through the biggest declines of the past year. But, if we relax the parameters a bit and get defensive as the VIX merely approaches its lower BB – like closes within 0.10 of the lower BB – then we can avoid a lot of pain. Edited by robo, 08 February 2019 - 09:18 AM. Edited by redfoliage2, 08 February 2019 - 01:11 PM. Next week is a monthly OpEx week. There is a good chance for spx to get over the 200 ema then. as Valentines Day approaches and thoughts go to Al Capone and the end of prohibition - now that the canabis prohibition is ending too - any thoughts on it feeling a lot like 1929? big deal on STZ who started with prohibition! It's a war right now for control of the 200ma -- bulls staging a fierce battle, bears selling into rallies but unable to knock out the bulls. an actual recession .... am looking for that in 2020, not 2019.